My friend Sue R made this and I sampled it today….I can’t wait to make it this weekend! 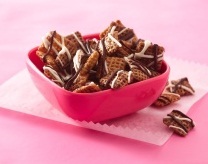 Caramel and chocolate crunch and it’s Gluten-Free! Into large microwavable bowl, measure cereal; set aside. Line cookie sheet with waxed paper or spray with cooking spray. on High 1 to 2 minutes, stirring after 1 minute, until melted and smooth. Stir in baking soda until dissolved. Microwave on High 3 minutes, stirring every minute. about 1 minute 30 seconds or until chips can be stirred smooth (bowl will be hot). My family loved this. A perfect snack…crunch, chocolate, caramel. I used melted vanilla chips and melted milk chocolate chips and criss-crossed the design.